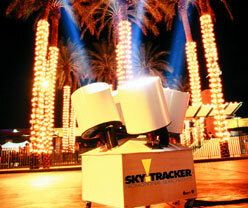 At SkyTracker, our searchlights can be used for multiple events at the perfect price. Our spotlights can be plugged into any standard electrical outlet and can be placed on the ground, roof or fit easily into any tight area. 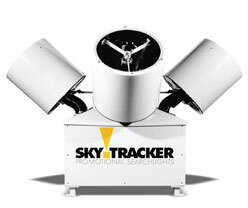 We also offer SkyTracker single head and four head searchlights. 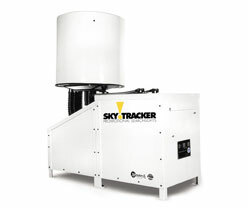 Each SkyTracker searchlight unit is completely self contained on mobile trailers with their own generators-- No electricity is required for use! These powerful search lights can be seen from miles away! Not only are these lights incredibly bright, they are also very easy to move into any location. 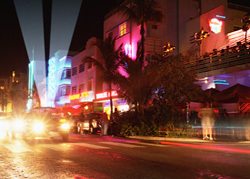 These Sky Tracker searchlights are the perfect addition to any outdoor advertising that you are already doing. Searchlights are great for tent events, high school events, college graduations, sports events, promoting nite clubs, specials, sales and grand openings! We have customers that rented these lights to create a Hollywood effect for sweet sixteen parties and even theme parks who are planning a special event! *on all rentals of four days or more! Search light Rental Port St. Lucie: Sky Tracker FLA Offers a Searchlights and Spot Lights to Draw Crowds to Your Big Sale! If You're Looking to Drive More Attention to Your Next Big Outdoor Event or Car Dealership Sale in the Port St. Lucie Area of Florida, Call Us Today! Search Light Rentals in Port St. Lucie!